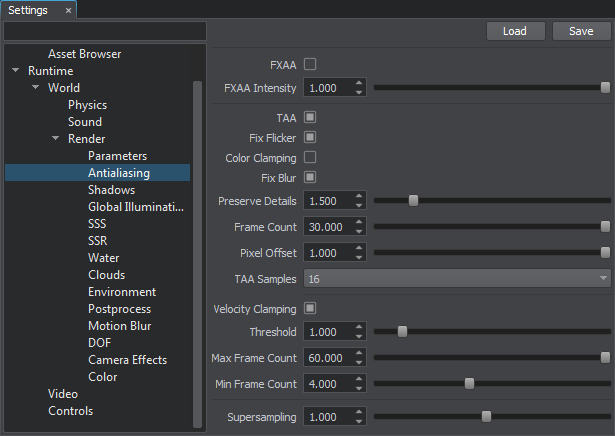 This section contains settings of anti-aliasing: both the Temporal Anti-Aliasing (TAA) and Fast approXimate Anti-Aliasing (FXAA) can be configured here. Toggles FXAA (post-process anti-aliasing) on and off. Can be controlled by render_fxaa console command. Intensity of the FXAA. It specifies the sample offset of the FXAA fragment. The higher the value, the more blurred image will be. Can be controlled by render_fxaa_intensity console command. Toggles TAA on and off. Removes bright pixels by using the pixel brightness information from the previous frame. We recommend to enable this option for bright thin ropes, wires and lines. However, when enabled, may produce artifacts by removing small bright objects. Can be controlled by render_taa_fix_flicker console command. Clamps the pixel color in the current frame with its color in the previous frame. If the pixel color in the current frame differs from the pixel color of the previous frame a lot, these frames aren't combined and blended during TAA. The image becomes more sharp but it can produce additional flickering, thin objects may be blurred (e.g. grass, metal structures, wires, etc.). Can be controlled by render_taa_color_clamping console command. Toggles Catmull-Rom resampling on and off. The option allows you to reduce image blurring when the camera moves forward/backward. It is recommended to disable resampling at low settings. Can be controlled by render_taa_catmull_resampling console command. Controls the TAA detail level: the higher the value, the more detailed the image. At the value of 0, the image becomes blurred when moving the camera, however, the TAA effect is better. At high values, this option may produce additional flickering. Thus, to improve the anti-aliasing effect, you can decrease the value; to minimize blurring - increase it. Can be controlled by render_taa_preserve_details console command. Specifies the number of frames that are combined and blended during TAA calculation. The higher the value, the more frames are combined into the final image and the better anti-aliasing. Can be controlled by render_taa_frame_count console command. Specifies the size of the sample offset performed during sub pixel jittering. This parameter allows specifying the offset that is less than a pixel: for example, if you specify 0.5, frames will shift to half a pixel. It enables to reduce image jittering and blurring. Can be controlled by render_taa_pixel_offset console command. Specifies the number of the sample offsets performed during sub pixel jittering. By the minimum value of 1, there will be no offsets, and, therefore, no anti-aliasing. The parameter allows reducing image jittering and blurring. Available values are 1, 4, 8, 16. Can be controlled by render_taa_samples console command. Enables the velocity clamping. It performs reprojection of pixels of the previous frame taking into account the velocity buffer and mix the resukt with pixels of the current frame. It reduces blurring and ghosting in dynamic scenes with a lot of moving objects. Can be controlled by render_taa_velocity_clamping console command. Specifies the velocity threshold at which pixels are treated as fast moving. Sets the number of frames combined and blended for pixels that don't move relative to the screen space. Sets the number of frames combined and blended for fast moving pixels on the screen. Sets the number of samples per pixel used for supersampling. The higher the value, the more reduced aliasing is (however, high values may produce visual artifacts).